Medicaid Rules Can Thwart Immigrants Who Need Dialysis : Shots - Health News About 5,500 immigrants who entered the U.S. illegally need dialysis. The publicly funded insurance they're eligible to receive only covers the treatment when it's urgently required. Repeatedly waiting to start dialysis until a patient is having an emergency can lead to serious, long-term health problems. So she waited as toxins continued to build up in her blood, and fluid gathered in her lungs. 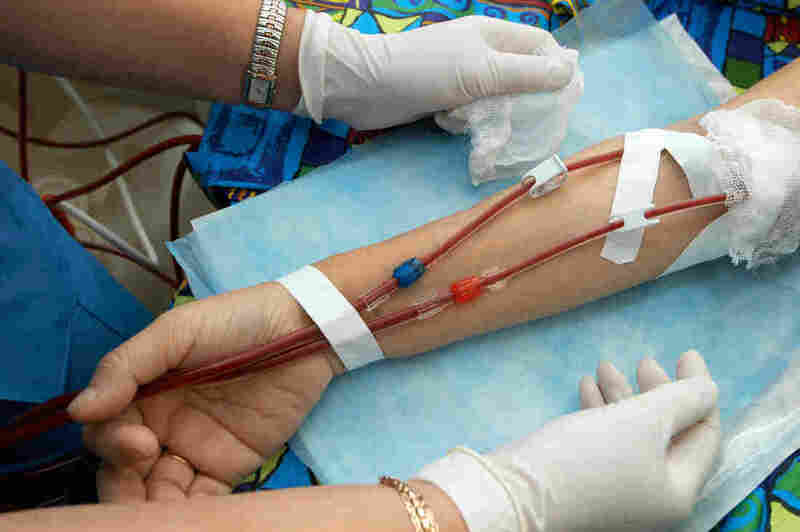 Standard treatment for people with kidney failure is dialysis every two to three days. But at that point, Carla was getting it about every 10 days, and sometimes ended up in the ICU because her symptoms were so severe. "I was like that for three months, suffering, throwing up. I couldn't eat anything," she says. "It was really hard for my daughter and my mom and dad to see me like that." Eskenazi Hospital declined repeated interview requests for this story. Carla can't afford private health insurance. And like the estimated 5,500 immigrants in the U.S. illegally who need dialysis, the only publicly funded insurance she's eligible for is a government program called Emergency Medicaid. But in most states, including Indiana, hospitals can't bill Emergency Medicaid until they know for sure they're dealing with an emergency. So for kidney disease, doctors will often wait until there are dangerous levels of potassium in the blood or fluid in the lungs — levels they deem urgent enough to merit hospitalization. Carla's doctor, Melissa Anderson, is a nephrologist in Indianapolis. She says she quit working at Eskenazi partly because repeatedly delaying dialysis harms the patients. "You see them one day, and then you see them two months later, and they've aged and you can see the suffering. ... You know they might die before you see them again," she says. "It's heart-wrenching." For many doctors who treat kidney disease, it's an ethical issue. In fact, the Renal Physicians Association published a statement saying that dialysis for noncitizens should be covered by Emergency Medicaid. "They're here, they're working and live with us, they are part of our communities," says Michael Gardner, a doctor and hospital administrator in Houston who deals with this issue. "To ignore that they require health care like anyone else in the country — I think it's morally suspect, and I think it's fiscally foolish." He says it's "fiscally foolish" because it costs a lot more to wait for emergencies. Instead of just paying for dialysis, you end up with more expenses, such as ER charges, lab charges, X-ray charges and medication charges. In a paper published in 2007, researchers from Baylor College of Medicine found emergency treatment is 3.7 times more expensive than regular dialysis — costing more than $280,000 a year per patient. And taxpayers are footing the bill. "It'd be one thing if it was better care for more cost, or worse care for low cost, but it's bad care for high cost. It's the worst possible answer," says Gardner. He says one better answer is charity care. For instance, Gardner runs the Riverside Dialysis Center in Houston, which gives free dialysis to 176 people, primarily undocumented immigrants. Another solution is for states to change their Medicaid guidelines to treat the need for regular dialysis as an emergency so hospitals can bill Medicaid for it. Some states, such as California and New York, have already done that. But in Indiana, a bill to fix the issue — authored by state Sen. Jean Breaux — has died in committee for the past two years. For Carla, the short-term solution was charity care. A local hospital lent her in-home equipment to do peritoneal dialysis. Every night before bed, Carla connects a tube to an opening in her abdomen. The other end of the tube connects to a machine about the size of a couch cushion. While she sleeps, it pumps fluid into her abdomen to clean her blood. The real goal is to get off dialysis for good. Carla's doctor has told her that a transplant would be ideal for her, and her brother is even willing to donate a kidney. But her undocumented status means she has no way to get coverage for a transplant operation. She'll need a visa for that. She applied two years ago, and she's still waiting for it to come through. Side Effects Public Media is a collaborative health reporting project based at WFYI in Indianapolis. Jake Harper can be reached at 317-614-0482 or jharper@wfyi.org. Follow him on Twitter: @jkhrpr.